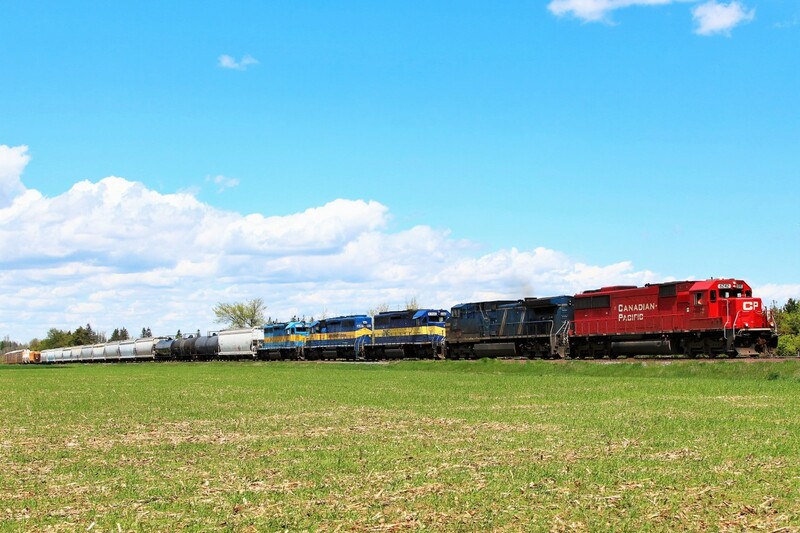 Railpictures.ca - BPurdy Photo: Here was a really nice surprise!! While doing some landscaping at MM43, I heard on the scanner CP 6242 cleared through Puslinch and then cleared down the Hamilton sub. Nice, an SD60 on point. I waited a bit and around the corner came an even bigger surprise with CP 6242 leading CEFX 1031 and DME 6366, DME 6363 and DME 6360. I got my shots there and shot down to the Hamilton sub to get the whole lash up in one shot and here they are about to cross the 8th Concession on the way to Desjardins. | Railpictures.ca – Canadian Railway Photography – photographie ferroviaire Canadienne. Caption: Here was a really nice surprise!! While doing some landscaping at MM43, I heard on the scanner CP 6242 cleared through Puslinch and then cleared down the Hamilton sub. Nice, an SD60 on point. I waited a bit and around the corner came an even bigger surprise with CP 6242 leading CEFX 1031 and DME 6366, DME 6363 and DME 6360. I got my shots there and shot down to the Hamilton sub to get the whole lash up in one shot and here they are about to cross the 8th Concession on the way to Desjardins. Daniel, I can remember not all that long ago when three units arrived in Toronto, went to Windsor, went back, went to Welland, went back, and after that, who knows? I believe they were destined for the MM&A at the time. Talk of confusion!! We used to joke that the locomotives were “on tour”. So you just never know about Welland Yard. Anything can happen; and does! @awmooney, CP has set off several GP9′s and even ex AMT F59PH’s there when their intended destination is in the U.S. Very weird, but it has happened quite a few times. Nice shot Bill! Love the wide angle. Wonder if these units are part of the list of units for sale, Snakie-lad. Someone might be able to confirm these are sold. This is something we see very infrequently these days. I understand these three trailing units have been set off in Welland, for whatever reason. Nice shot, Mr. Bill. were the DME’s dead in transit ?